Industrial & Commercial Bank of China Ltd., the world’s most profitable lender, said it will consider acquisitions in the Middle East as part of plans to boost earnings from the region by 50 percent this year. “We’re looking to see if there are acquisition opportunities,” Zhou Xiaodong, chief executive officer for the Middle East, said in an interview from the lender’s Dubai offices. “It’s a good strategy. Part of the reason why ICBC grew so fast in Hong Kong is because of acquisitions.” ICBC is seeking to triple overseas earnings by 2016 and targeting more business with Middle Eastern companies after previously focusing on the local units of Chinese firms in the region, Zhou said. Profit from the Middle East amounted to $33 million in 2013, he said, and the bank plans to open retail branches in Kuwait, Saudi Arabia and the United Arab Emirates. ICBC lent $600 million to regional clients including Emirates airline, Qatar Airways and Dubai Electricity & Water Authority in 2013. This year it’s seeking to boost lending to Dubai real estate projects, energy companies in Abu Dhabi and infrastructure work in Qatar. In January, it advanced $201 million to Dubai-based real estate investment company SKAI Holdings for the development of a hotel on the Palm Jumeirah. “There’s a deep blue sea of opportunity for ICBC to develop its business in the Middle East,” Zhou said. “The Middle East business will play a very important role.” China is the third-largest trading partner with the United Arab Emirates, and the second-largest trading partner with Saudi Arabia. Trade with Saudi Arabia rose by 188 percent between 2007 and 2012, according to data compiled by Bloomberg. ICBC expects to become the first Chinese lender in Saudi Arabia, the Middle East’s largest economy, when it opens later this year in Riyadh and may also apply for two further branches in the country, Zhou said. It’s also in talks with the Central Bank of the U.A.E. about retail branches in the country. Approximately 2,500 Chinese companies are registered in Dubai, mostly in construction, according to the emirate’s Chamber of Commerce. 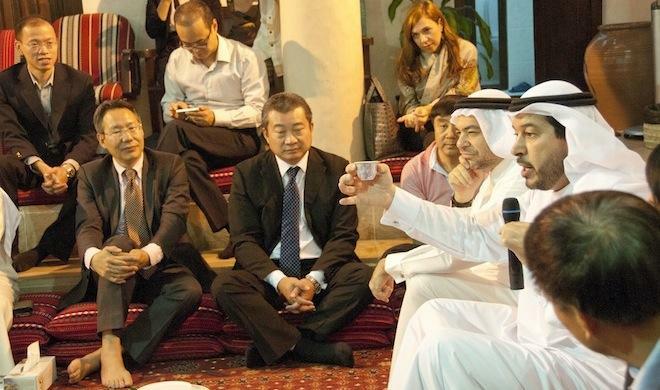 More than 200,000 Chinese expatriates live in Dubai, the Chamber says. Shares (1398) of ICBC gained 1.5 percent in Hong Kong as of 10:23 a.m. to HK$4.86. The stock has declined 7.3 percent in Hong Kong this year amid concern about Chinese lenders’ mounting bad loans and risks from shadow banking. Since 2007, ICBC Chairman Jiang Jianqing has spent about $7 billion on more than 10 acquisitions from South Africa to the U.S. as the bank follows corporate clients expanding abroad and seeks to tap demand for yuan-denominated goods and services. The Beijing-based lender last month agreed to buy control of Standard Bank Group Ltd.’s markets unit to expand in trading spanning commodities and interest rates to currencies. ICBC expanded into Hong Kong in 2000 with the acquisition of Union Bank of Hong Kong. In 2004, it bought the Hong Kong retail banking arm of Belgium’s Fortis, followed by the acquisition of Chinese Mercantile Bank a year later, according to the bank’s website. In 2008, it purchased Hong Kong-based Worldsec Asset Management Limited. ICBC’s Hong Kong operations reported a profit of HK$4 billion ($516 million) in 2012, up from HK$3.1 billion in 2011. Economic growth in the six-nation Gulf Cooperation Council is forecast to accelerate to 4.1 percent in 2014, up from 3.7 percent last year, according to the International Monetary Fund. “The economy is booming in the U.A.E. and the Middle East,” Zhou said. “We’ve more than 200 clients here and we would like to develop more.” ICBC had 388 branches overseas in 39 countries and districts as of June 30. Operations outside the mainland had combined assets of $182.2 billion, accounting for 6 percent of the group’s total, according to its earnings report at that time. Pretax profit at those units climbed 24 percent in the first half of 2013 from a year earlier to $1.07 billion.